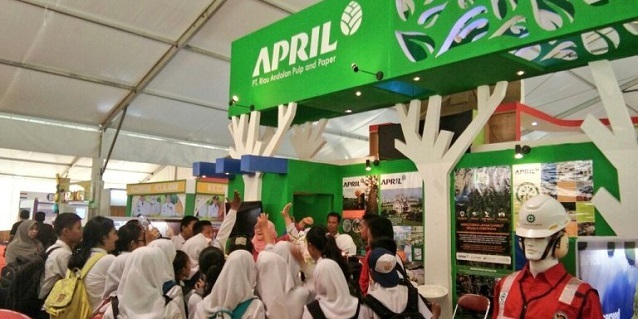 To recognise successful fire prevention and management in villages, APRIL Group’s Indonesian operations PT Riau Andalan Pulp and Paper (PT RAPP) held an event on November 18, 2015 in Pekanbaru to award various villages for their concerted efforts in the Fire-Free Village Programme. Having launched the Fire-Fire Village Programme in July 2015 with nine participating villages, APRIL Group has seen a significant decrease in fires in the communities with which it has collaborated. 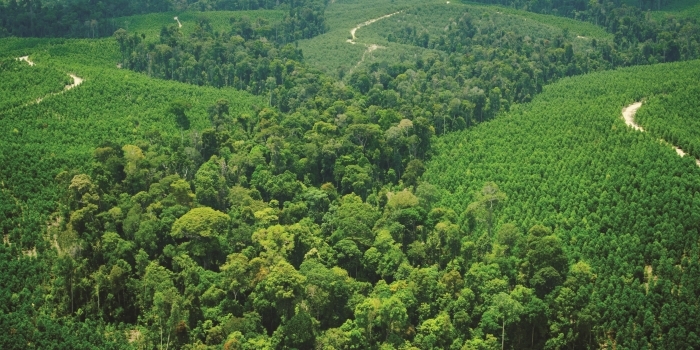 The first of its kind, the Programme comprises a multi-prong community-focused approach to fire prevention that includes awareness campaigns, air quality monitoring, use of sustainable agricultural alternatives, training community fire crew leaders and incentivising villages to collectively and effectively prevent fires. 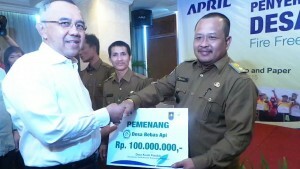 Guest-of-Honour Riau Acting Governor Arsyajuliandi Rahman was on hand to award these villages. Three villages (Kuala Panduk, Petodaan and Segamai) were awarded IDR 100,000,000 (~USD 7,200) for having no fires. Another three (Teluk Binjai, Kuala Tolam and Pelalawan) were awarded IDR 50,000,000 (~USD 3,600) for limiting the spread of fires to less than two hectares. 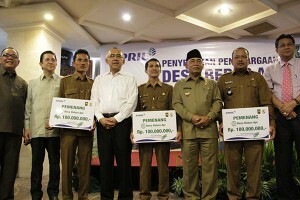 APRIL Group’s Indonesia Operations Managing Director Tony Wenas explained that the awards will be used for infrastructure development in the villages. 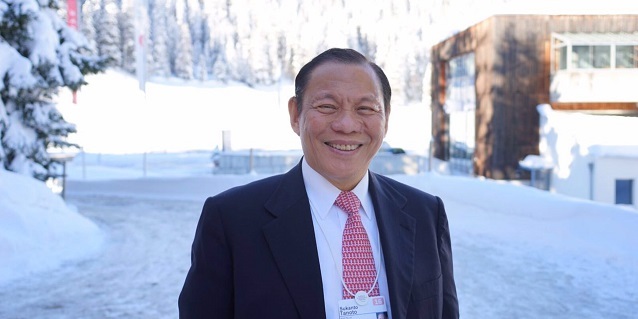 This echoed his earlier speech in the “People” panel discussion of the Sustainable Development Goals segment at the Responsible Business Forum on Sustainable Development on November 4, in which he touched on how the private sector can play a complementary role to the government in infrastructure development. PT RAPP has long been recognised as one of the companies who have continually collaborated with the communities within and around its operation areas, as well as the local government and NGOs to facilitate and enhance the development of the community and infrastructure. Mr Wenas added that apart from extending the Fire-Free Village Programme to April 2016 because of the prolonged El Nino, APRIL also aims to include more villages in the Programme. Governor Rachman expressed hope that other companies will follow APRIL and roll out similar initiatives in fire prevention. 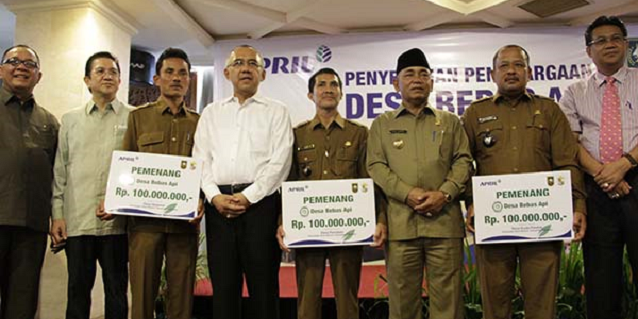 With more participating villages, he said overall awareness will improve and more areas in Riau can be fire-free. Acknowledging the positive impact of the Programme as “satisfying”, Mr Wenas said fire prevention will remain a collaborative and community-focused effort. All these projects have been operational for between 6 – 8 months and the results are very encouraging. In previous years these communities would generally start to burn areas during the dry season after resulting in dozens of small fires. With no management some of these fires would quickly spread. Conservatively we estimated that these communities experienced between 3 – 7 fires every week during the July – September fire season in past year. This means that during the 14 weeks of the fire season there were between 42 – 98 fires in village areas. This year, for the first time, fires have been monitored and actively suppressed. As a result the number of unmanaged fires in the Fire Free Village areas is between 0 – 3 for this entire season. More on the Fire-Free Village Programme awards at APRIL Dialog.